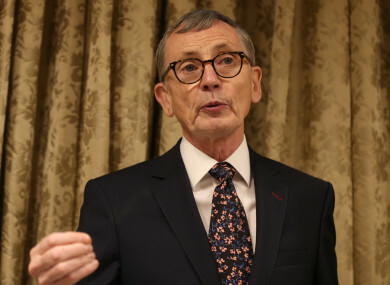 A REVIEW BY Dr Gabriel Scally into HSE practices following the CervicalCheck controversy has found that the “deeply flawed” open disclosure policy that existed prior to the scandal remains in place. Dr Scally’s latest review into the Department of Health’s implementation of his recommendations following the CervicalCheck scandal was published this morning. The doctor’s review into CervicalCheck last year identified 221 women subsequently diagnosed with cervical cancer who were not told that slides from an earlier screening could have been interpreted differently. These issues came to light when women diagnosed with cervical cancer, such as Vicky Phelan and Emma Mhic Mhathúna came forward to tell their story. Dr Scally subsequently proposed an overhaul of the screening programme. In his latest report on the progress being made, he said the HSE resources given to implementing his recommendations is a “proportionate response to the scale of the issues and challenges”. “I am satisfied that this work is being taken forward very seriously and that an effective project management process is in place,” he said. While he was encouraged by progress to date in a number of areas where he had recommended changes, there remains some cause for concern. Furthermore, Dr Scally also raised concerns at the HSE’s approach implementation of his recommendations and said it could be trying to do them too quickly. He said that it may be beneficial for the HSE to review its deadlines to ensure that all the recommendations are acted on fully. Dr Scally also noted that of his recommendations in his original report last September, 71% of these are the responsibility of the HSE. Others apply to patient advocates and, on this, he also raised concerns. “One outstanding issue that has still to be resolved is the inequity that results from patient advocates engaging in crucial regular and demanding work on implementation but having to do so on a voluntary, unpaid basis,” he said. A number of measures proposed by Scally are contained within the proposed Patient Safety Bill, which – when enacted – will set out only a very limited number of instances where the option remains not to disclose an error to a patient. Minister for Health Simon Harris said today that the government fully accepted Dr Scally’s recommendations and work is underway at his department, the HSE and the National Cancer Registry to act on them to “ensure full implementation so that women can have absolute confidence in our cervical screening service”. The next review from Dr Scally is due in May. Email “'Deeply flawed' policy on open disclosure in the HSE still in place, Scally review finds”. Feedback on “'Deeply flawed' policy on open disclosure in the HSE still in place, Scally review finds”.